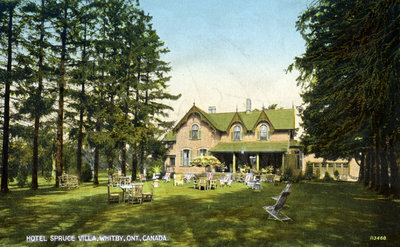 A colour photographic postcard of the Spruce Villa Hotel. This brick house was built for W.H. Clendenan, about 1875, on the north side of Dundas Street, east of Wellington Street (at 734 Dundas Street West). It became the Spruce Villa Hotel about 1920 and was enclosed in a modern building in 1950. Hotel Spruce Villa, Whitby, Ont., Canada. Spruce Villa Hotel, c.1930, Photographer Unknown. Whitby Archives. Scanned from a colour postcard.